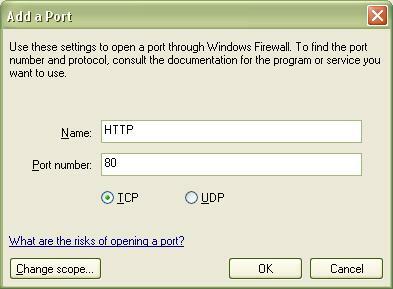 As a hacker, it is necessary to know the basics of port opening and forwarding. Why is that? 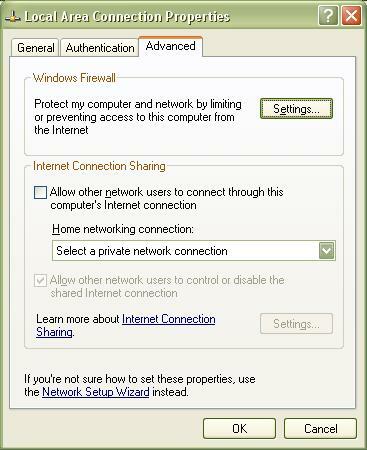 Computer enthusiasts usually setup firewalls so that they can be online with less worries of an outside intrusion from the untamed Internet. They also usually have programs that require access to a port. Some programs include BitTorrent (Shame on you! ), P2P Gnutella programs like Phex (Shame on you! ), NetMeeting, some instant messaging programs, and servers (like HTTP, Remote Desktop, FTP). Since firewalls block all ports, it is necessary to manually open the ones that are needed. Most firewall programs let you choose which ports to leave open. I use the native Windows XP Firewall, which makes it pretty simple. 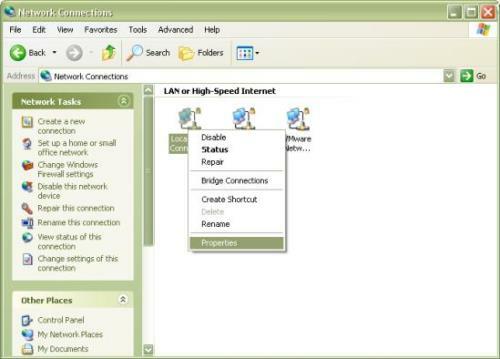 Go to the “Control Panel” and open “Network Connections.” Right click on the connection that you use to access the Internet. Most of the time, it is “Local Area Connection.” Select “Properties”. Depending on which version of Windows XP you have (Original Build, SP1, SP2) you may see something different. Regardless, you should have upgraded to SP2. If not, shame on you! Go to the Exceptions Tab (in SP2). Give the port a name, any name, a name that will inspire and astound you, a name that is descriptive of the activity that will be going through it (i.e. “Gnuttella Traffic”). Or, you can just call it “asdfjkah jfhdas;jh fj;;sjfku;.” It’s your pick. “Port Number” is a bit more restrictive. Give the number of the port that needs to be opened. You may have to look this up online if it is not a common port. HTTP uses 80, FTP uses 21, P2P Gnutella uses a range of ports, as does BitTorrnet. Specify which protocol you want to use, TCP or UDP. To be sure, just do this process twice selecting TCP the first time and UDP the second time. OK? OK! Click OK, OK, OK, OK! Voila! You have opened a port! You’ve opened a port. So, the program (or server) should work right? Wrong! If you are sharing an Internet connection with anyone else, if you are sharing an IP address, or if you are using a router, more than likely, port forwarding is necessary. Why? In a typical home networking setup, you have the Internet coming from a DSL or Cable modem. That modem is connected to a router, which is then connected to your computers by Ethernet or WiFi. The router is the device that the Internet sees; it holds the public IP address. Your computer, on the other hand, is invisible to the Internet as it holds a local IP address (normally 192.168.0.2). Port forwarding is necessary in the router because computers will send information directed to the public IP address and the router needs to know where to send that information, your computer or any other computers on the network. To forward a port, you need to have access to the device (i.e. router) that holds the public IP address. For most networks, this is your local IP address with the last number at 1. For example, if your computer is on 192.168.55.100, the administration console for the device is 192.168.55.1. Just type that into an Internet browser. When it asks for the username and password it is usually “admin” and no password. See the router manual or just hard reset it (with a paperclip) if you don’t remember the password. Basically, you will enter any name for the port that you want to forward. For Private IP, give the IP address of the computer on your network that will need this port. Protocol is whichever one you need for your setup. Do both like you did in the port opening example above to make sure you will get correct access to the port. Private port is the port that is opened on your local computer end. Public port is the port that you want to forward on the router. Usually these two will be the same. Presto! You have port forwarding! If you have any questions, leave a comment and I will try to answer them. This entry was posted on Friday, March 24th, 2006 at 3:34 pm	and is filed under Networking. You can follow any responses to this entry through the RSS 2.0 feed. You can leave a response, or trackback from your own site. how can i make a remote desktop application in php? what are the steps i should follow? or can you help me giving this kind of programs code in php? look forware to hearing from you. to my knowledge, there is no way to make a remote desktop application in PHP. since PHP is a server side language it would definately be too slow and html rendering would be chaotic. if you still need help, feel free to contact me. thanks a lot for your reply Alan, i'm seeing it right now, if i've any question then i'll tell you. I have a desktop connected to a router as well as a laptop, that connects wireless to it. When I forward ports for the laptop, i experience no problems as such, but when I do the same for my desktop, the internet connection gets very slow. This is particularly seen when I download torrents. How can i correct this problem. I would just go to your torrent client connection configuration and limit the uploading (and maybe even downloading) speed. You could also limit the number of concurrent connections instead of the actual bandwidth. how to find administrative console address when the computer is connected in LAN? if you are using windows xp/net type "cmd" then "ipconfig"
all other windows users type "winipcfg"
the gateway ip address is usually the admin console address. Any pointers for enabling port-forwarding where no router is employed? My cable modem connects directly to my main PC, which has a second NIC for the local network. I am streaming video on a laptop and can view the stream on any other PC using http://192.168.0.15:1066, but obviously someone calling on http://(my IP address):1066 needs to be redirected from this main PC to the laptop. In Windows Firewall 'Exceptions' I created a new port entry 'Laptop Streaming' with Port number 1066 for TCP. Change Scope left at 'Any computer'. In Windows Firewall Advanced tab I changes settings for my ISP connection to add a new 'Laptop streaming' entry with name of 192.168.0.15 and 1066 in both ports for TCP. Can't see what I have done wrong but it refuses to connect. I liked your thorough explanation. But unfortunatly my configuration is different. I have a ASUS P5W-DH based PC with two NICs and wireless on board. One nic is hooked up to the cable modem and the other PCs at home connect to the wireless. All this works fine unless I want to access any of these "other PCs" from the internet (e.g. using simpledesktop). Well I can do without that (though it would be really nice) but I want to run a ftp server within a virtual machine on that main PC. And that is where it gets tricky. The ftpserver (filezilla) receives my connection attempt, but answers "could not send reply, disconnected". It is not firewalls blocking anything - I disabled them (host: xp (prof.) firewall, vm:: sygate personal firewall) for a quick trial. I'd be happy for any suggestions which way to turn next. i thoroughly liked how you explained everything, but i still can't get my port to show as open. i'm using utorrent and trying to forward my utorrent files to my computer. now when i check to see if my port is forwarding, it shows port not forwarding for i totally different IP address than the one i had put in the router to specify my computer. does that have something to do with it? i've been trying to get this port forwarding to work all day. please help if you can. Hi. I have a situation and i will be pleased if someone will help me. I have a small local network between 2 computers using a shared connection. The first computer has an internal DSL modem (Intel(R) PRO/DSL 2200 Modem), the second computer connects to internet thru the first thru LAN... How can i forward a port? I could not find any information useful to me.. except some basic information about NAT.. The thing is that my modem has not a WEB Interface.. It has just some basic config (VPI,VCI... Line Coding Stardart). Can i make it to forward a port? Maybe there is some software doing that? The thing is that i want to acces my second computer thru internet from my office with Remote Administrator (famatech). Thanks in advance and sorry for my english.. Im from Moldova. I don't have a router. MachineA have direct connect to internet and MachineB (know as 192.168.0.2) have a apache server. I set port forwarding for P2P applications and works fine, but with the apache server don't works. With MachinaA I can access to 192:168.0.2:80, but from outside not. I did a port forwarding for port 80, but don't works. how do i forward ports if the router is a windows xp server? 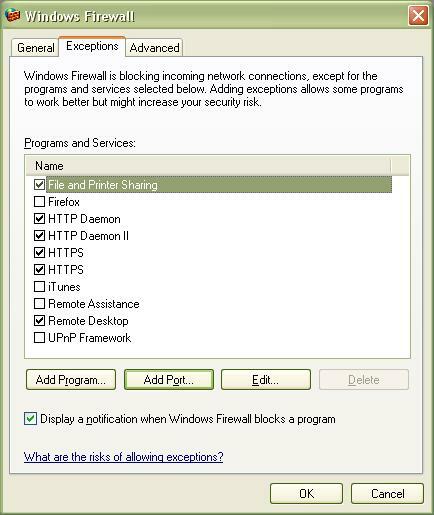 Windows did not detect any problems with your internet connection over HTP or HTTPS, but was not able to make a successful connection over FTP. the most likley cause of this problem is that a firewall client running on your machine is blocking the necessary FTP ports. Vinod, my only diagnosis is that your office network blocks ftp ports. this is no surprise to me. many public networks do this. my only suggestion is to do setup a VPN if you have broadband at home. That way, any port available to you at home will be available to you remotely at work. read my VPN article for more details. I connect my windows box to my office using "Juniper your net". telnet 10.x.x.x 9999 to connect to port 9999 from my windows box. I also have a linux box at home. telnet (windows box) 9999 from my linux box and have it go through the juniper tunnel and connect to the office. I can already telnet from linux to windows, and then from windows to office, so it seems I ought to be able to pass through, but I can't figure out how. I HAVE A NETWORK AT MY OFFICE THAT I NEED TO OPEN A PORT TO SO THAT I CAN TUNNEL INTO IT FROM MY HOME. i HAVE A ROUTER AT WORK WITH A DESKTOP AND LAPTOP CONNECTED TO IT. MY IT GUY THAT SETUP THE WORK NETWORK SAYS THIS CAN BE DONE BUT WILL CHARGE ME ALOT TO COME TO MY OFFICE AN DO THIS FOR ME. HE SAID ALL I NEED IS MY LAPTOP AT WORK AND HE CAN SET IT UP IN A MATTER OF MINS. CAN YOU HELP ME OR TELL ME WHAT TO DO? In Windows Firewall ‘Exceptions’ I created a new port entry ‘Laptop Streaming’ with Port number 1066 for TCP. Change Scope left at ‘Any computer’. In Windows Firewall Advanced tab I changes settings for my ISP connection to add a new ‘Laptop streaming’ entry with name of 192.168.0.15 and 1066 in both ports for TCP. Can’t see what I have done wrong but it refuses to connect. This is the exact same problem i'm having, how do I forward ports that computer B needs opened on computer A (host)? Hey there..this Q may not concern the topics above but i wanted to ask if cracking the password of a router is possible? Prob is that i am in a shared house and unfortunately with all knowledge and capabilities, i am unable to go through the router. Does a software to crack the router's password exist or is there any other method to go in or open a port without going in? Thanks for letting me know. How about if you don't know anything about the device that holds your shared ip? ...let's say I'm in a library and I want do download a torrent... is there any way to forward a port? i use a dsl connection havin shared ip. I know that my internet provider has ZyXEL router, but i dont see any way to add port there, all it shows me is network information and that its connected and totally working, nothing about ports listed there. i got a problem; i can\'t get to the router, by just inserting the adress in the browser; for instance the adress is 192.168.1.1; i type the adress, and it wont connect to the server; can u help me ? Just to be annoying, your site has php codes in a html document. 1. what Windows batch command can I use to test whether the port is actually opened or not? Sth like ping, but for a specified port. 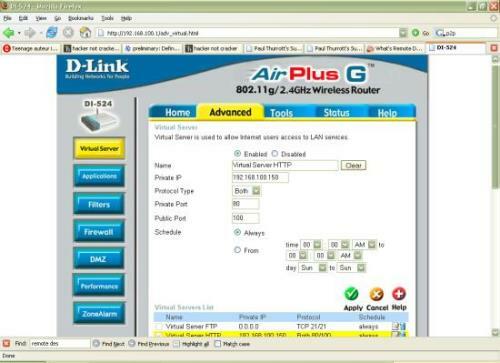 For Windows, there is a program "pc-port-forwarding" (www.verifed.com/products) which performs forwarding of ports without routers. For incoming and outgoing connections it displays popup messages each time forwarded connection is established. it even performs a reflection of traffic back to the source on a different port! Hello allen and to everyone, no questions from me yet......just a simple Thanks for the info you post. As I'm very new to this type of computer play, Almost every post is very intriguing to me. I can only hope that I can post useful info one day for you people.Thanks again!! Hello. I'm Mona from Iran. If possible, could you tell me how to open port 8123 on Windows Seven. I do not speak much English. shelter and a loving atmosphere will get truly boring. As their claws grow out they'll be tempted to scratch everything around them.